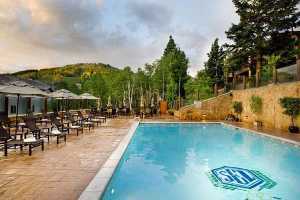 As Utah's first Forbes Five-Star Hotel and the World's Best Ski Hotel, Stein Eriksen Lodge Deer Valley, is the premier resort destination for both leisure and business travelers alike. Located mid-mountain at Deer Valley Resort, the Lodge is of the most accessible, year-round hotel destinations in North America. Each of the lodge's units, ranging from deluxe bedrooms to four-bedroom suites, is unique in style, architecture, and arrangement. Guests can enjoy breakfast, lunch, and dinner throughout the year at either the Forbes Four-Star Glitretind Restaurant or Troll Hallen Lounge. In addition, guests have access to 24-hour in-room dining and private dining facilities. The 23,000 square-foot spa at the lodge is dedicated to wellness and relaxation. Known for being Utah's only Forbes Five-Star spa, the facility includes 16 treatment rooms, featuring two couple treatment rooms with a shared relaxation room, and two wet treatment rooms. Guests may also enjoy an outdoor heated pool and hot tub, exclusive mountain bike rental and riding trails on property, fitness center and separate men's and women's relaxation rooms during their stay.